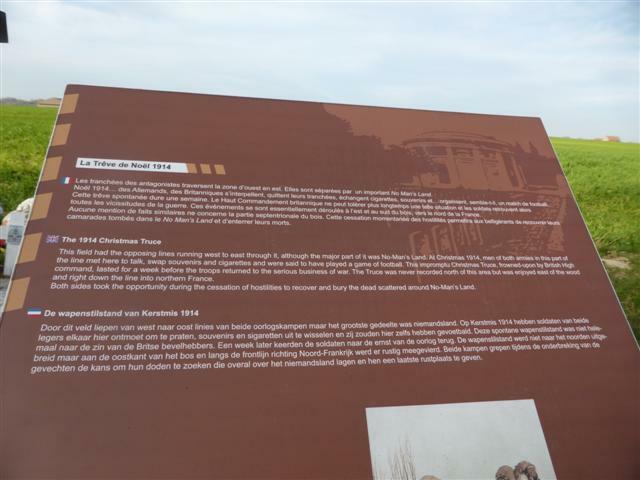 Home » Countries » Popular Articles » Plugstreet, Mons & the WW1 Christmas Truce. Belgium. Plugstreet, Mons & the WW1 Christmas Truce. Belgium. 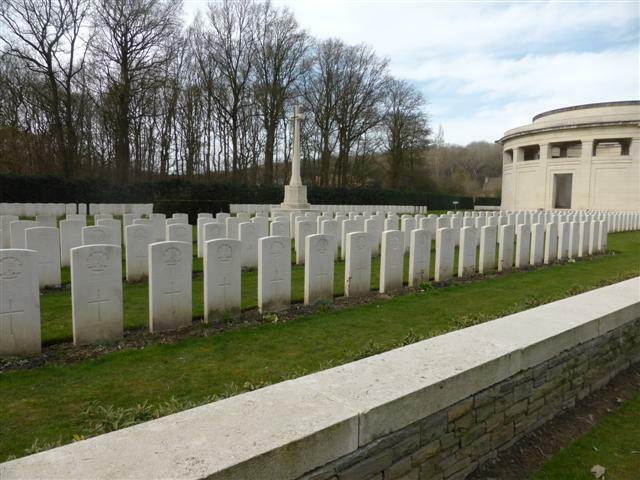 Ploegsteert, or Plugstreet as it was called in WW1, is two miles North of Armentieres and the French border, and eight miles South of Ypres. It has a large Memorial, and rows of graves lined up on either side of the main road, so they can’t be ignored by passing motorists. It commemorates the death of over 11,000 British and South African servicemen who were killed in World War 1. Although this happened 100 years ago, the whole area is immaculate and well-looked after as though it happened last year! There are 11,400 names on the Memorial. 200,000 are unnamed. R Palmer of the biscuit family is buried there, amongst the neat rows of gravestones. Nearby is the Plugstreet 14-18 Experience museum. Partially built underground, it shows an interactive display of what happened throughout WW1. We climbed back on the coach and drove just a couple of miles to the place that interested me the most. It’s such a fascinating, moving story! 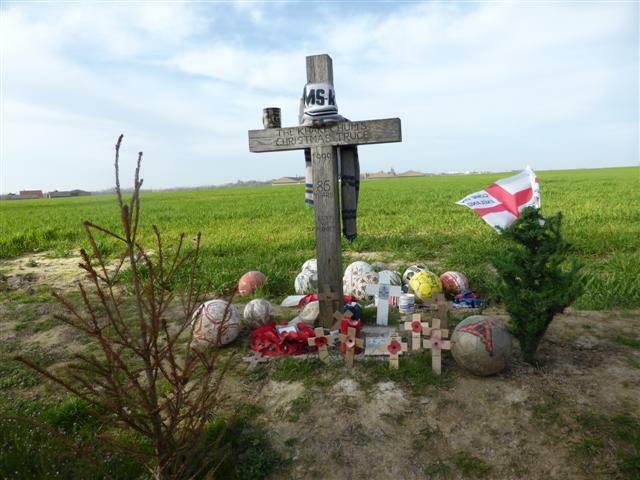 The St Yves Cross marks the site of the Christmas Truce Football Match. There are of course, slight variations of what happened on that day. But the main facts are well-documented. 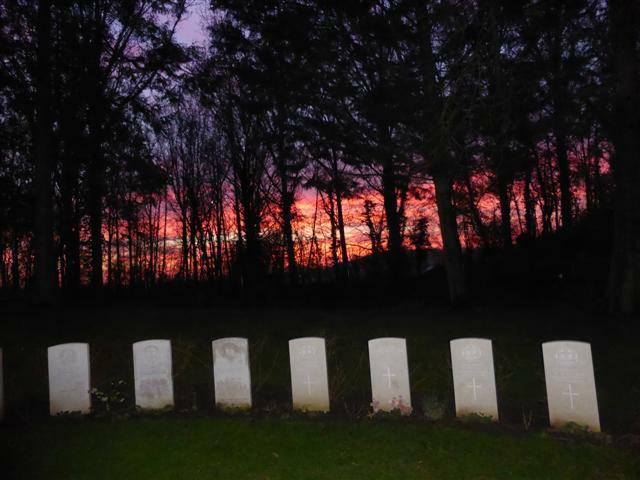 Just after dawn on Christmas Day, 1914, the soldiers awoke to an eerie silence. All gunfire had stopped. Then floating across from the German trenches came the sound of singing; ‘Stille Nacht. Heilige Nacht. Alles Schlaft, einsam wacht’. Everyone slowly emerged from the trenches into the bitterly cold area of No-Man’s Land in the middle. First, both sides collected all their dead, retrieving the bodies. They shook hands with their enemy, lit each other’s cigarettes, and exchanged addresses and tunic buttons. The Germans gave the Brits sausages and sauerkraut and the British gave them chocolate. That’s when the famous ‘football’ game took place, Brits v Germans. No, they didn’t have a football; they used empty bully-beef cans and used their helmets as goal posts. At midnight, flares went off to say that the truce was over. Everyone said their goodbyes, then with a final wave, they turned their backs on each other and returned to their trenches. On Boxing Day, they were killing their new friends of the day before with their addresses in their pockets, family men with names and personalities, not just army numbers in a trench, and with fiancees, wives and young children at home. We all signed a couple of footballs and left them with the other balls laid round the cross. Perhaps we should have brought an empty tin can instead, maybe with signatures placed inside it! Belgium’s most beautiful cemeteries. British and German soldiers are buried there together. Both the first and the last British soldier killed in WW1 lay facing each other. As we wandered around this peaceful place, the sunset spread across the sky, a deep blood red. So many lost lives; some of them no more than children, aged 16. Darkness fell and we silently made our way back to the coach, lost in thought. Psycho politicians fall out, and millions of innocent people lose their lives while obeying orders. And it’s still going on all over the world. Will we ever learn? Probably not! « Danger! French Jam Can Kill!